Yes indeed, got there early this time and managed to get a 1500 point game in this week. So... this week will be more of a battle report than anything else. Of course we sat around and talked about the hobby like we usually do, sharing army updates and showing each other what we've painted recently. That kind of stuff. And then we threw down. This week, I got to face off against a Salamander army composed almost like my own force. Two land Raiders (Prometheus and Crusader), 2 squads of Terminators, Vulkan and a pair of Razorbacks with lascannons and small power armoured squads inside. The only difference is he had Razorbacks and I had Venerable Dreadnoughts really. We came up with Annihilation and Dawn of War on what we imagined to be an abandoned Imperial outpost now overgrown. Lots of cover but enough areas for vehicles to run around in. We wanted to be able to use our tanks. I was fortunate to drop both of his Razorbacks in the first turns denying him his long range firepower. Of course, a hunter killer missile from one of his Land Raiders managed to completely obliterate one of mine in the opening turn which left me at huge disadvantage for the rest of the game. And, he managed to charge his fully loaded Prometheus and Crusader up the middle of the board and bring the fight right to me in no time at all. Seeing one of his Land Raiders become immobilised in their rush up the middle, I decided to sacrifice a Dreadnought, finish off his immobilised vehicle and pull back the rest of my force. I knew I could do it, but I was most likely going to lose the Dread. 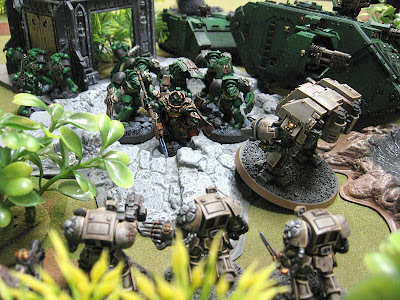 Sure enough, I destroyed the tank and when all the Salamander Terminators armed with Thunder Hammers disembarked, I could see the writing on the wall for my Venerable hero. It was only a matter of time then. By that time, it was the 5th turn and I rolled to see if it would end or the carnage would continue. Fortunately for me, I rolled a 2 and it ended 3 kill points to 2 in my favor. A win, but just barely and by the luck of the dice. Just for fun we played turns 6 and 7 which would have turned out to be a draw and a win for me respectively. We both had some pathetic dice rolling, but I happened to get just the right rolls when I really needed them. I'm not gonna lie, facing off against two Land Raiders can be a tough nut to crack and you've definitely got to prioritise your targets. Especially with Deathwing. I've got to know what to shoot and when so that I get the most from each turn. Sounds like it was fun game, glad you managed to sneak the win, I find thats often the way it works with the 'wing. By the way, that photo is simply awesome, my compliments to the camera man (which I assume is your good self?). I hope get another game in next week! Oh I just love your Oldtimer posts. Always those nice painted armies. Keep it up! sovietspace: I thought for sure I was going to get hammered when I lost my one LR. I take photos after the game and "stage" the scene to portray what happened during the game. I try and make them dynamic looking while staying true to what actually happened. Cannonfodder: Thanks. These posts are fun for me because they are a collection of stuff and not just about one topic. I need to get a routine down and post them regularly so people know when to expect them.